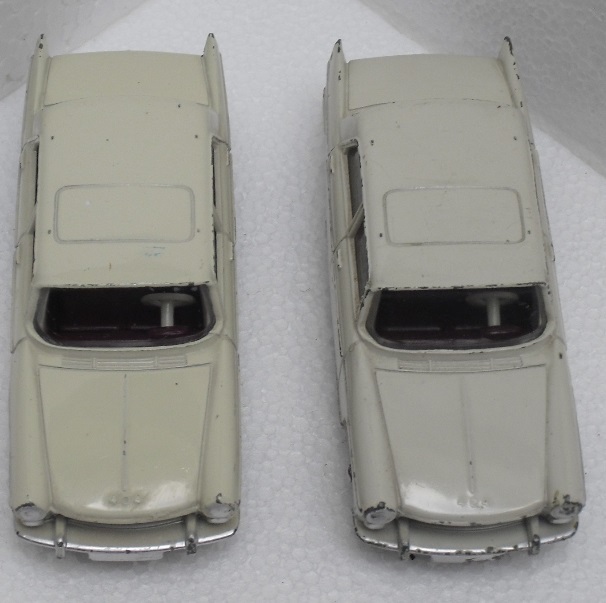 Peugeot 404 first issue in cream colour, aubergine purple seats and white steering wheel but much more "yellow" than my other model which is more "grey"
A recent arrival, although not diecast, has been a batch of Meccano drawings for some later models. These incidentally do not appear in the Richardson's acquisitions, nor listed anywhere previously. I presume these were acquired while Meccano was in its death throes. 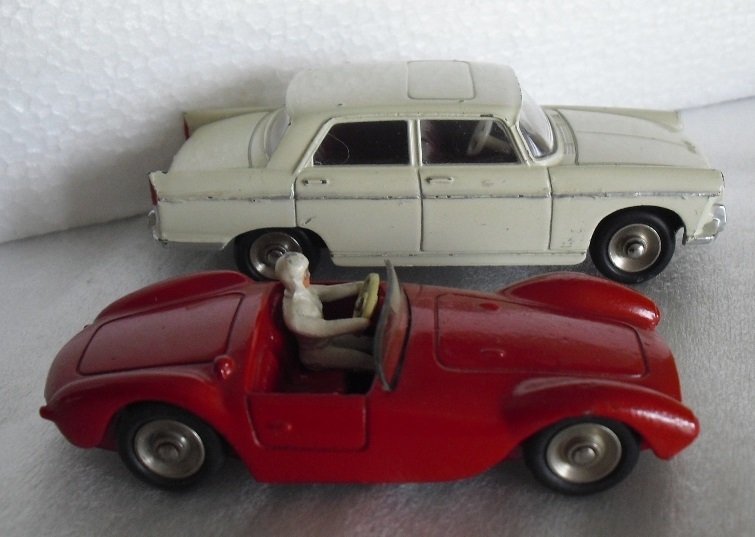 Still, they are very interesting and the layout is different to that used in earlier years such as the actual colour is specified by name rather than number as well as the type of box, or carton being the terminology used in which the model is to be packaged. Another interesting detail included is how the body is assembled. These assembly drawings were the standard for models from I think 1967/1968. I have several of these, Junkers Ju 87, Spitfire, Hurricane, Messerschmitt. These are phototypes made at Meccano as Meccano had a department for reproduction of documents and drawings. I bought mine long ago also at a Vectis sale. Interesting you have the assembly of the Princess saloon,as a copy of the dieline drawing was offered several times at Ebay. 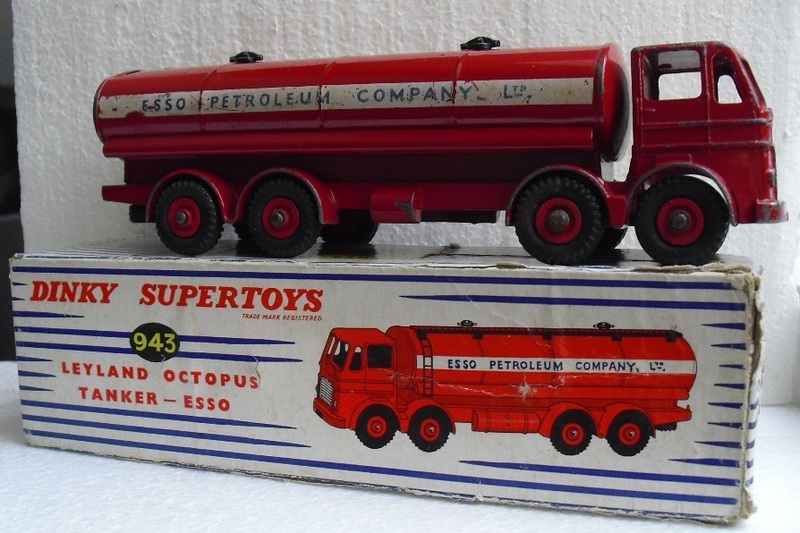 One of my favourite Dinky Toys in the Leyland Octopus. 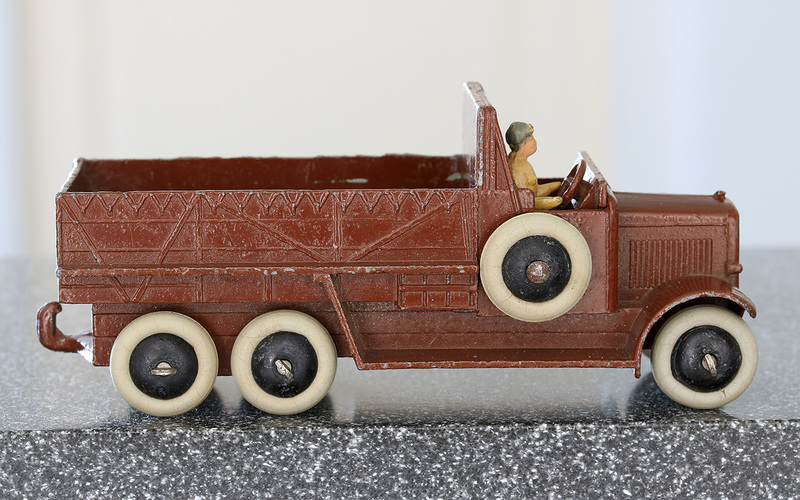 I could not resist a 935 Leyland flat truck with chains fitted with grey wheel hubs, although it was play worn. I have a mint boxed red wheel one and it was interesting to compare them. 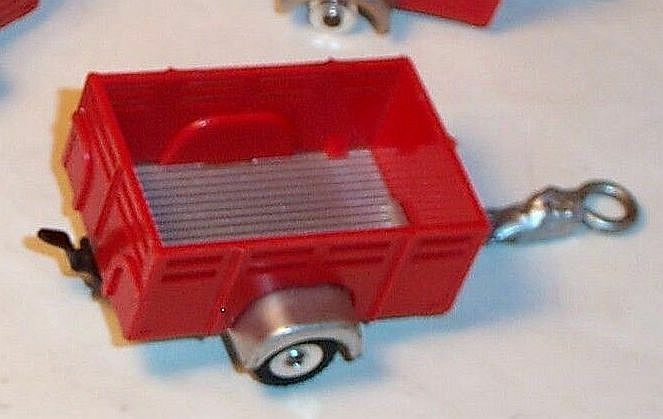 The later grey wheeled one does not have the tin-plate tank slots and the screw holes for the plastic tank are larger. The green paint is slightly darker and the ejector pins are more prominent - probably 'wound back' since the removal of the tank slots. Ron, this observation is interesting enough to re-post this message + photo in the Commercial Vehicles >> 934 thread! After a wonderful DTCA weekend I returned home with two only-dreamt-of acquisitions, a great 34a Airmail Van - 'excellent for its age' as we call it, and a virtually mint blue 281 Luxury Coach, without its box. Both relative bargains that we had not imagined only a decade ago. And upon arrival home I found a notice in my letter box asking me to pick up a parcel from the post office. Contents: a very fine tiltless no. 25s with fixed civilian driver, smooth hubs and nice smooth white tyres. Another easy bargain: The Times They Are A Changin' ...! 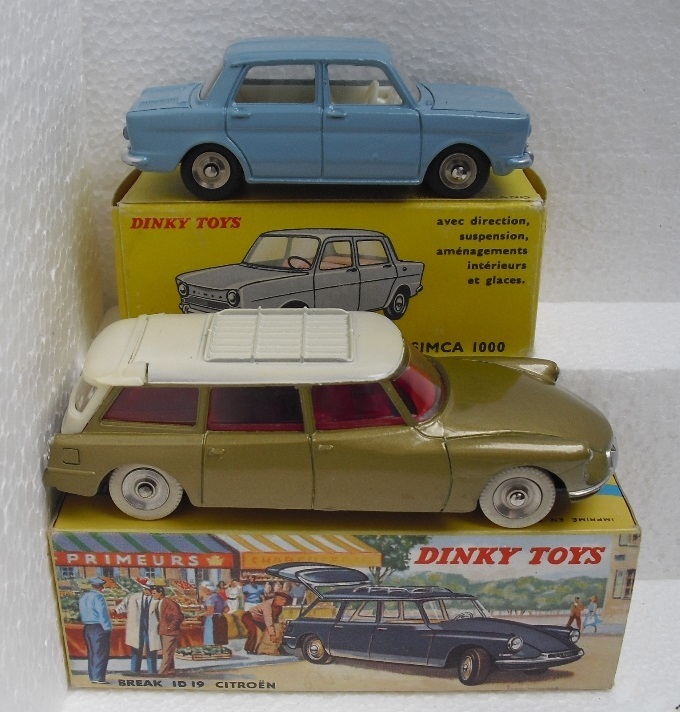 Jan---As usual, wonderful models and examples of prime time Dinky Toys. Those two older ones are especially nice....I love those pre-war & early post-war versions. That Mail Car is superb....most seem to have quite a bit of fatigue present.....great scores! I somehow thought that you would, one day, locate and acquire an excellent 34a Royal Air Mail Service Car, and may I join with Terry in congratulating you on a fine acquisition. (The other two aren't bad either!!) I guess you can tell where my heart rests! That lovely 34a is indeed in fine shape with just the smallest hint of fatigue. I like the darker blue hubs. Thought I would indulge in a comparison with both examples! Now, don't they look nice together! Unfortunately, yours comes up trumps! Kind regards and again congratulations! Terry, Bruce, thanks for your nice comments. This one has fatigue problems too, but other nice qualities compensate for that! I would apreciate a large 3/4 front picture of your 34A for the Encyclopeadia. I knew about the black wheels but I do not have a good picture of the model. Jan , what a wonderful catch !! I am dreaming to find the same ! I was very happy to meet you in Derby last week, even if it was for a short time ! It was time to come home because my letter-box was full !! I will add some commentaries on the right topics. Two new arrivals bought within New Zealand. 448 Chevrolet El Camino pick-up with trailers. Strange set really, but nearly mint and with a yellow interior to make Bruce happy! Has anyone got the open trailer with filled in slats at the top? This is one I saw on eBay but I didn't bid because of the broken tow bar. Secondly, a late 674 Austin Champ. Late issue with plastic hubs, driver and steering wheel. Late box? Sorry, I do not even have a picture of this variation, nor has Vectis. Has anybody ever seen one ? Is there any evidence that it has been issued ?. Beautiful pick-up you have ! For my part, few days away and when I returned, these was in my letter box ! This Post is in reference to the following Posts that can be found on starting on Page 25, "New Arrivals". 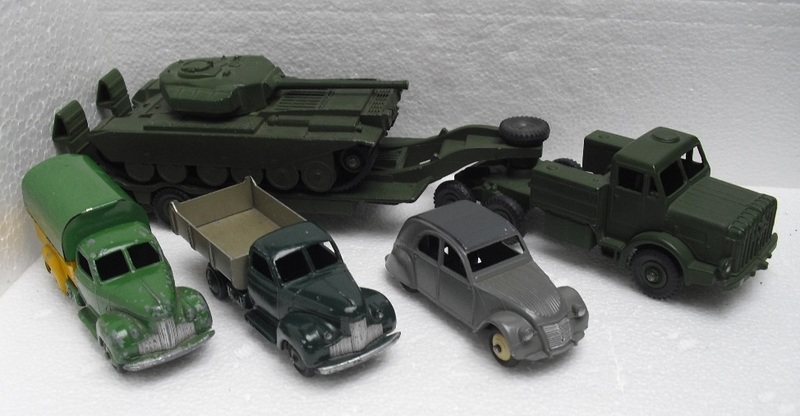 One of the "Special Lots" shown as a photograph was a trade box for a 25X with a full set of four Breakdown Lorries. Well, this morning I almost needed a larger car to bring home three large boxes from the post office. The first parcel opened contained the 25x trade box filled with Breakdown Lorries. Here are the first pictures of the new arrivals, taken indoors with a flash, which I normally do not use, preferring natural sunlight. Today is a gloomy, damp with misty rain, not what one would call a typical Brisbane, Queensland weather and by necessity indoors was the only option! But the box does contain something that I was not expecting. This will be revealed when I complete writing a new Post for the 25x-430 Breakdown Lorry topic! (After I make a decision on which Topic to use, as at present there are three in existence!!) For the observant, the tow hooks are loose in the bottom of the box, and these will have to be restrung. I have been in direct communication with several members concerning this "trade box", as it is in fact a forgery, cleverly executed (I would like to do that to the person who submitted the item for sale), and a complete embarrassment for me. 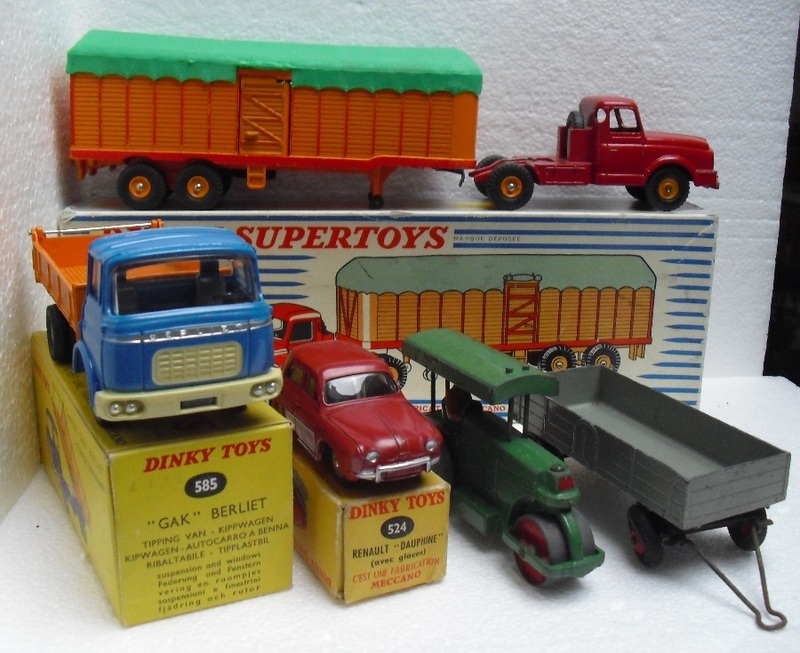 I have pondered for several months whether to publish these details on this website or leave it rest as there has not been any enquiries through the DTCA with this "25X Trade Box", but have decided that it is in the interest of members and others who collect Dinky Toys to be extremely cautious with anything being passed off as a "trade box" for a 25x Breakdown Lorry. The following are images that caught my attention once I carefully examined the box, on realising that the Breakdown Lorries did not fit in the box, except on their sides with no room for a cardboard divider. The above image is of the other end label. The quality inspection date stamp GW 453 does not relate to a period when the 25X would have been packaged in a trade box. 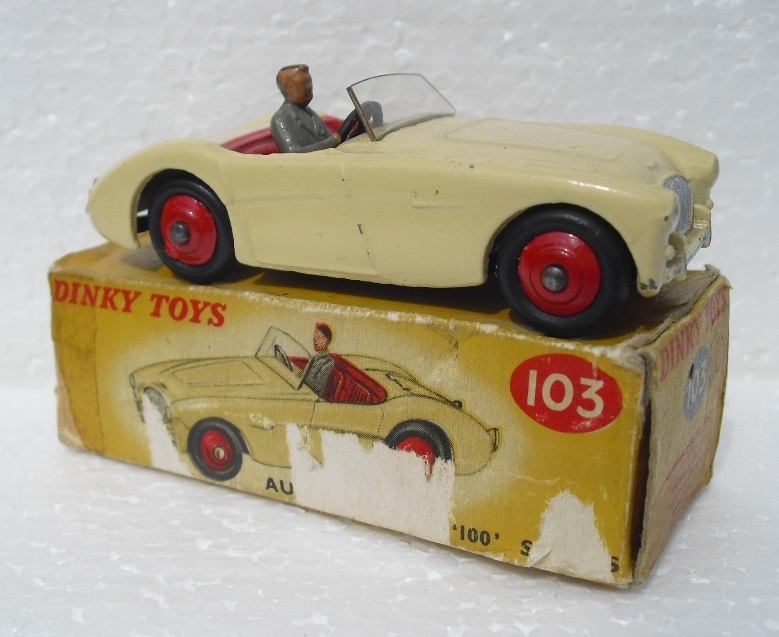 On seeking advice from a number of highly respected Dinky Toys collectors, the conclusion reached is that this box has been carefully doctored as a counterfeit/forgery which has unfortunately deceived not only your staff but all those who lodged bids in good faith. Someone has gone to extraordinary lengths to bring about this deception. 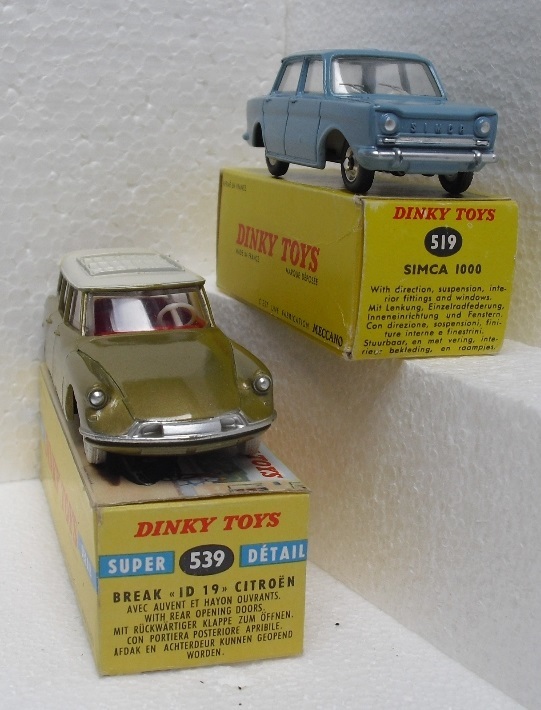 Someone who knew the 25x came in a trade box for 4, as well as the factory Code Number at the top of the label, 50039 where usually the name DINKY TOYS appears. Was this Trade Box created by a collector whose only interest was for his own purposes who has since passed away taking with him an explanation. Whatever the reason, a vendor has lodged with your company an item that misrepresents a true 25x Breakdown Lorry Trade box. I am attaching photographic copies of the box and its contents that provides pictorial evidence of this fraudulent item. I respectfully request that you carefully consider the above, take this matter up immediately with the vendor, and arrange a full refund of my bid amount plus ancillary charges. Naturally the box and contents will be returned at your cost. sadly we are outside our terms and conditions to make a refund as the vendor has been paid out. I understand we have both been hoodwinked and indeed the vendor had no idea either. As a good will gesture we could offer a refund of £120 and you retain the goods, this is our best and final offer. My reaction is not fit to be printed, and on approaching several very good friends in the UK, one responded who owns an auction company: If one is being cynical, in this case the person at Island Auction Rooms may have reckoned that since ***** is in a separate legal jurisdiction, there is nothing he can do about it. I have made plenty of mistakes in my time, but I try to sort them out and be reasonable. I think when this person says they are outside their Ts and Cs, they mean that they can’t get the money back from the vendor? When we have similar situations here (although not selling such an obvious fake I hope) we pay up the capital sum – the full amount – and if the auction is closed I have chosen to refund out of my own pocket sometimes. I don’t want to talk ill of others but I think this stinks and the ignorance of both vendor and auction house is no proper defence, they should pay up in full. I was then provided with advice with whom I should refer this matter, but as this could become quite protracted, and of course, legal costs have to be weighed, I decided to accept the unreasonable offer and of course carefully note never do business again with Island Auction Rooms. However, I am not finished with this saga, and am currently exploring the matter through a very good friend in the UK that the current "Auction Bidding Act 1927" is woefully outdated and considering the electronic age in which we exist today, more protection has to be provided by those bidding in absence, through telephone, postal, or internet means with this Act being brought up to the 21st Century. 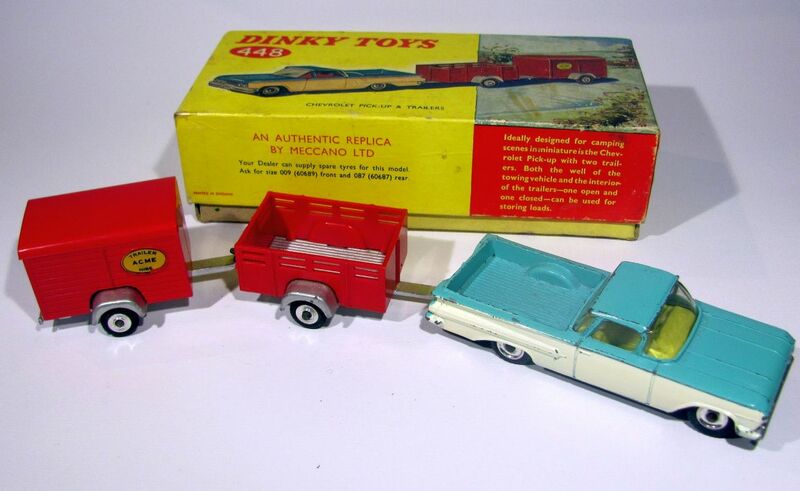 I wonder if this was the box that initiated its presence in Ramsay's British Diecast Model Toys Catalogue, in which case, the publishers should be notified and have the entry removed, as such a trade box has never existed, except as a forgery, unless an indisputable, original and authenticated box comes to light, which I think never will. Finally, I will in time be posting a copy of this Post in the Topic 25X - 430 BREAKDOWN LORRY and AUCTION CATALOGUE DESCRIPTIONS, (the latter not necessarily the best place but saves creating a new Topic) although what good that will be is unknown as a recent Post I made in that Topic did not bring a whimper from anyone. Perhaps there are those who are delighted that this writer has had his fingers burned. Weetabix, Heinz, Ever Ready and Slumberland. and below the pictures of the auction. I would say that the Slumberland is definitely a repaint - being the first issue of the Guy vans it should have the earlier wheels, and no triangular strengthening below the radiator grille, which itself has too much silver paint applied. The Ever Ready, whether totally repainted or not, similarly has too much silver on the grille. Both appear to have body-coloured paint on the hinge pins. My original Slumberland has its door handles at 90 degrees to the vertical, these were later angled for ease of operation. 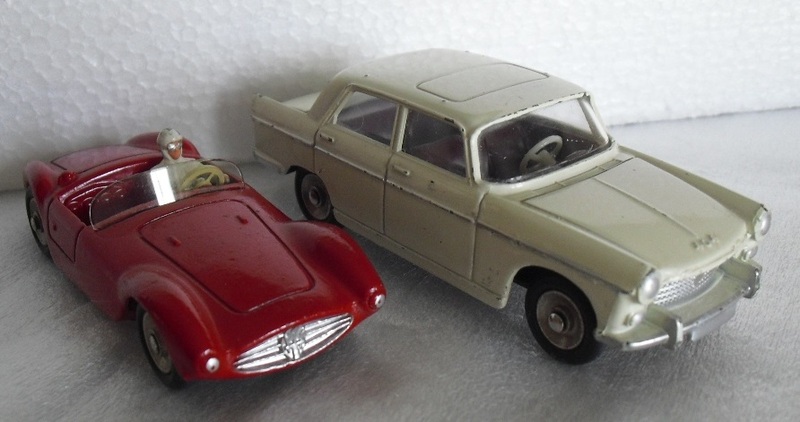 These particular models may even have repro doors fitted. For buying purposes, I would regard them as amateur restorations and bid accordingly. Thank you Jan O for your comments. I think the non-actions from Swan Fine Art Auctions is fairly typical of a lot of auction houses in the UK that now have access to either www.invaluable.com or www.the-saleroom.com when previously they only relied on inhouse participation. I have copied and edited my Post above and it can be found in the Topic "Auction Catalogue Descriptions" and may I urge you to copy your above two posts and paste them to that Topic. If any other member has had a painful experience with an auction house, or has documentary evidence showing the failure of an auction house to disclose matters of concern, may I suggest that you post your concerns in this Topic, to enable me to pass the details to my associate in the UK. In time, members will become aware of the process within an unexpected source. This will keep the topic "New Arrivals" only dealing with "new arrivals"!! Thank you again for your words as it is nice hearing the views from other members. Three new additions arrived and in honour of Jose and Nancy Heraud's visit to France, the Netherlands and the UK I organized a little Dinky party at home, almost twenty Dutch Dinky and related miniatures collectors attending, many of them on the photo attached. It was really big fun. Everyone had taken one or more remarkable miniatures, for discussion or simply to show off! Jan----What a fun and wonderful gathering to honor our friend Jose's visit to Europe. 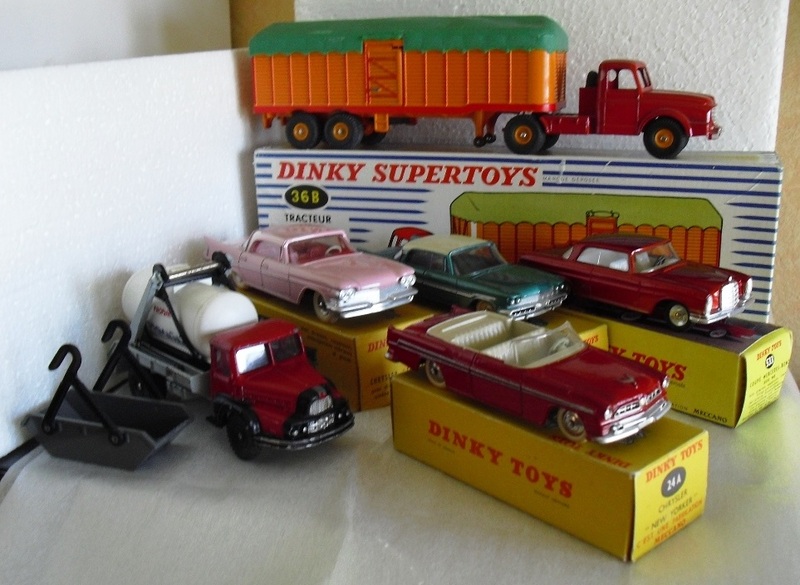 And the collection of Dinky's in those wonderful photographs was a site to behold....so many nice examples. And so nice to see you obtaining another French model with that lovely Plymouth.....congratulations Jan! We will have also and very soon, our great meeting, here in France with the french members : Jacques and I ......!! In the meantime, I received these items this morning. It's my first Antar and I am very happy to get one. It was to sale with the Centurion : I got both for 56 €, all included. I Think that's a reasonable price. The Citroën 2cv is the second type : 1 rear light, sand hubs and smooth ceiling. In that case - as a variations collector - you know what to look out for! yes Jan, I know .... thanks to the forum for that ! In waiting for a new Antar variation, I received this Leyland this morning. More details in the right topic. Some photos will complete the right topics. 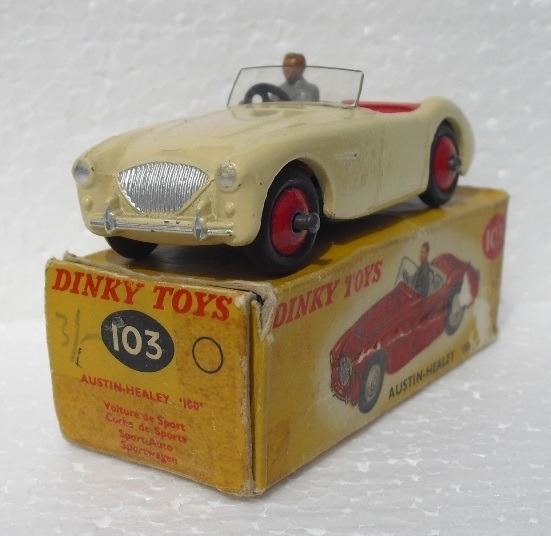 This Austin Healey arrived this morning in a very poor box ! But the car is splendid !